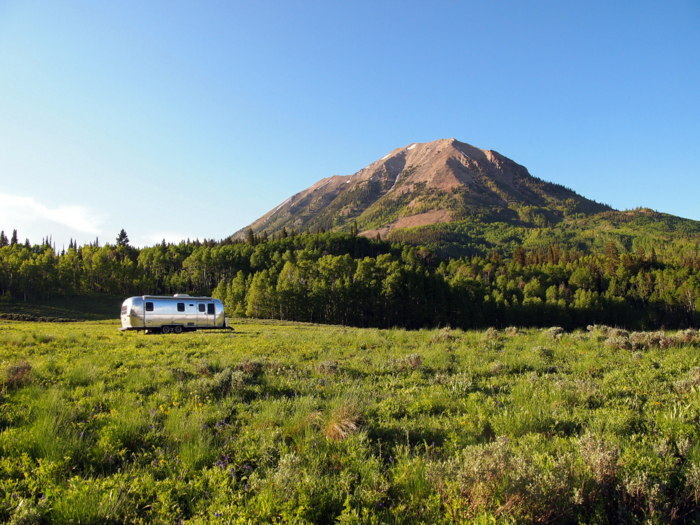 Last week we took a scouting trip from Rosy Lane campground to Crested Butte with the intent of finding a future camping spot. Our first stop was at the Oh-Be-Joyful campground alongside the Slate River just a few miles outside of town. I was excited about this place based on the name alone. Coupled with the fact that it was free and next to a river, I had high hopes that it would be perfect. Except it wasn’t. Not for us anyway. First of all, the road down to the campground was extremely rutted, which would have made for a very bumpy ride with the Airstream in tow. Second, there were really only two spots where we could have fit and gotten enough sun for our solar panels. 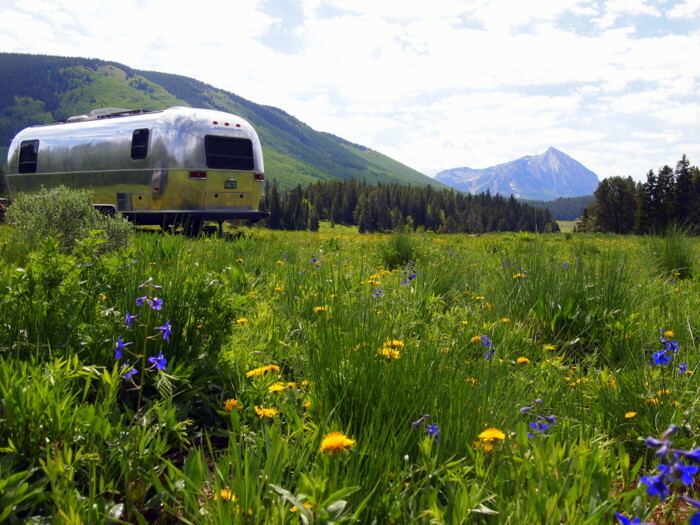 Oh-Be-Joyful seems like a great destination for tent campers, but not so much for RVs. Onto our second choice. We headed north of town on Washington Gulch Rd. After a few miles the road turned to dirt and we entered national forest land. Right off we spotted a few pull-offs with evidence of previous campers. We found an awesome spot up a little hill surrounded by trees, but with enough open space for us to get plenty of solar and views of the surrounding mountains. Perfect, we’ll take it! Except that it was only Wednesday and we weren’t planning on leaving Rosy Lane until Saturday morning. Just to be safe we drove up the road a little farther and decided that in a pinch we could find another spot in the nearby meadow. At some point we decided it made more sense to head up to Crested Butte on Friday afternoon, instead of waiting until Saturday morning. This meant skipping out on one night of camping at Rosy Lane that we had already paid for. Since we had nine nights of free camping ahead of us, losing out on the $18 didn’t really bother us. Especially since it meant that we would already be set up on Saturday morning, giving us the entire weekend for exploration. Well, it turned out to be a good decision because by mid-day on Saturday many of the spots on Washington Gulch Rd were filled with other campers. 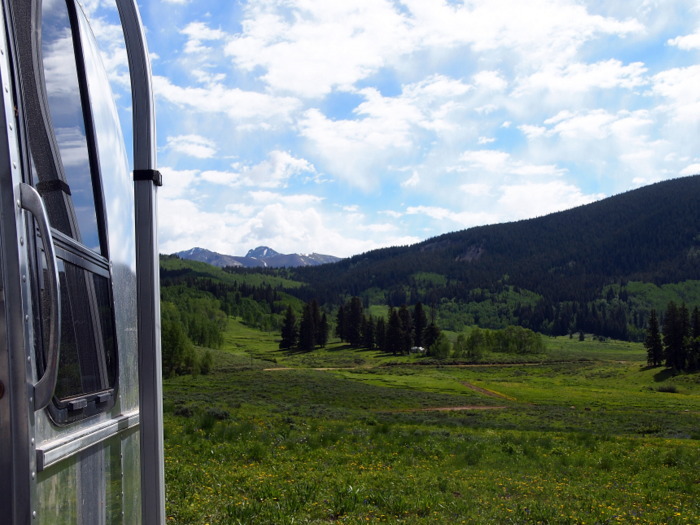 In fact, when we arrived at our perfect spot on the hill late Friday afternoon it was already occupied…by another Airstream. What are the odds of that happening? So we headed over to the meadow, and after a bit of moving around to find the most level spot we settled in to enjoy the view. In the end we are very happy with our meadow home. Even though we’re out in the open, it’s pretty quite around here. The traffic on Washington Gulch Rd. 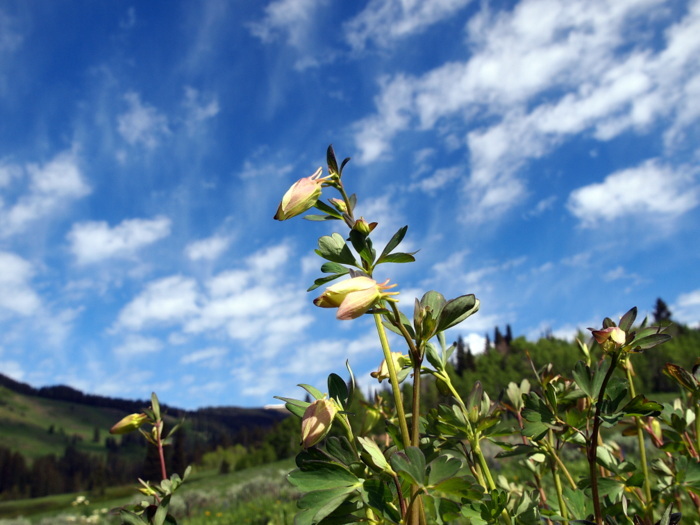 is limited mostly to other campers and the occasional person heading up to Paradise Divide. We’re up at a pretty high elevation, around 9,000 feet, so the temperatures are cool and we welcome the strong sun that shines down on us all day. Thank you again for sharing your gorgeous camping spots ! Have you talked to the other Airstreamers yet? Not yet. We need to walk over there. It looks like an older Airstream from here. Sorry, just another technical question. How does one find a good solar installation person for an AS? Like most anything.. seek out those who have gone before you. We did the solar install ourselves but got the parts and pieces from AM Solar in Eugene Oregon. Have only heard amazing things about them and we have nothing but good words as well. The Air Forums website has a solar forum that may help you find someone closer if your not near Oregon. Just awesome! What a beautiful spot to call home and the photographs from your hikes are “WOW”. I would enjoy some of those cooler temps…it’s pretty hot in Moab. I bet it’s hot in Moab! It was pretty warm even when we were there a few months ago. So far we’ve been pleased with our route planning as far as weather goes. We’ve had a few chilly nights, but when the day time temps are in the 70s we are happy! Hey, thanks for he write-up. 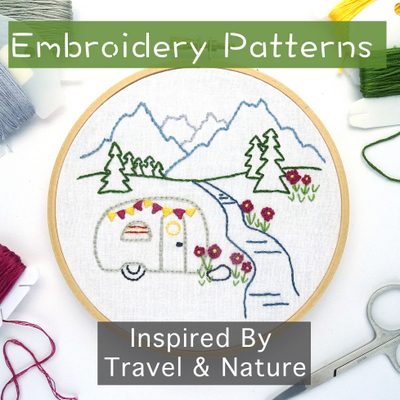 I am headed to the area this summer and wondered how good Oh Be Joyful would be for my trailer. Enjoy! 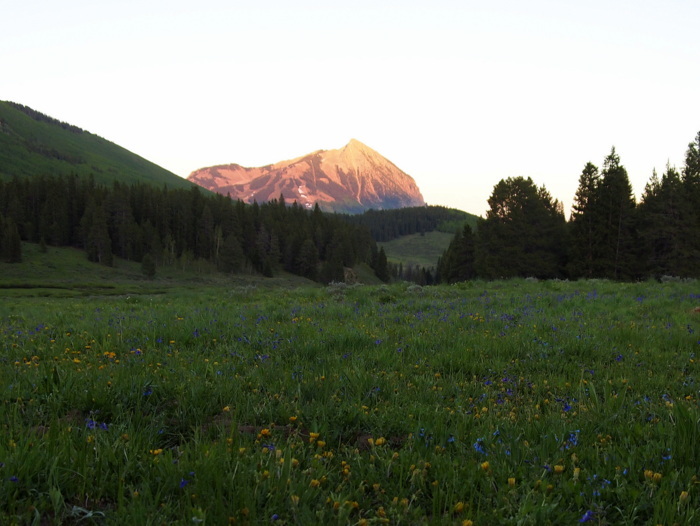 Crested Butte is one of the most beautiful places we’ve ever been. There are definitely some spots suitable for trailers at Oh Be Joyful, but chances are it will be crowded. Seemed to be a pretty popular spot. How do you find places like this?